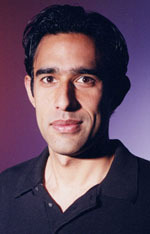 (Sept. 4, 2000) Echo Networks™, the first group music experience provider, is developing a broad set of relationships across the Internet and recording industries under the guidance of Tuhin Roy [pictured here], EVP of Strategic Development for Echo Networks. During the 1990s, Roy produced, composed and engineered songs that sold more than two million copies and yielded Billboard number one hits, MTV videos and slots on soundtracks including “Beverly Hills 90210.” Since joining Echo, he has been working to develop relationships with recording artists, managers and record labels who understand Echo’s ability to aggregate a passionate audience of streaming music fans. Immediately prior to joining Echo, Roy practiced corporate law in Silicon Valley, where he represented a wide range of Internet companies. “This is an exciting time to work with the major label groups as music promotion and distribution increasingly moves to the Internet,” said Roy. “Our aim is to build the most compelling, emotionally powerful offering in online music—one that truly serves consumers, the recording industry and our partners,” Roy continued. “Tuhin’s produced hit records, so he has great respect for copyright. He’s also been an attorney at one of the Valley’s top firms, so he understands how to structure deals that get done,” said Echo’s founder and CEO Dan Hart, a former venture capitalist who’s most recent success, Silicon Spice, sold to Broadcom for $1.2 billion on August __, 2000. “We’re hoping Tuhin can help us get front row seats for the good shows,” continued Hart, who removed headphones with pumping music to comment.